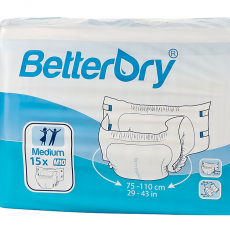 So I'm looking at getting a pack of diapers again, primarily because if the taps and toilets run dry here in Cape Town because of the drought, I'll have another option. I was looking for reasonably priced diapers today and Comfrey was most certainly the cheapest. I can't remember which one I used to get that worked wonders, but that was at a different store which I should maybe visit too. I'm sure people can appreciate the struggle to find a diaper that works for them, so it would be great to have some feedback. Comfrey - yay or nay? Basically, does it take a full load without leaking? I tend to build up the whole day and then release. Is one able to sit without flooding, or lie in a bed without concerns about leaking onto bedsheets? If the taps run dry, how will you clean yourself when changing the diapers you plan to use? Not sure about the diapers you are questioning as I have no information on them, but I'd pee in a jug or hand held plastic urinal then pour the contents on the ground if I didn't have any water to wash with rather than relying on diapers. Diapers are a great idea, but without water to shower, bathe or wash with I'd just as soon not have to go around sticky and smelly from urine skin. At first glance, I thought this was about the herb comfrey. I didn't realize there was a diaper brand with the same name. It seems to happen all over the place. I title my post appropriately, and ask a decent question... and everyone latches onto some random comment by someone else. My question was about Comfrey, as in the title. Who would recommend it, and for those who wouldn't, why not? Gosh - one would think I'm speaking a different language in my original question!